(l-r): Conor Hogan, Manager, Data Protection, Privacy & Security, Mazars, Annette Hogan, Consultant, McCann FitzGerald, Paul Lavery, Partner and Head of Technology & Innovation, McCann FitzGerald, and Liam McKenna, Partner, Mazars. 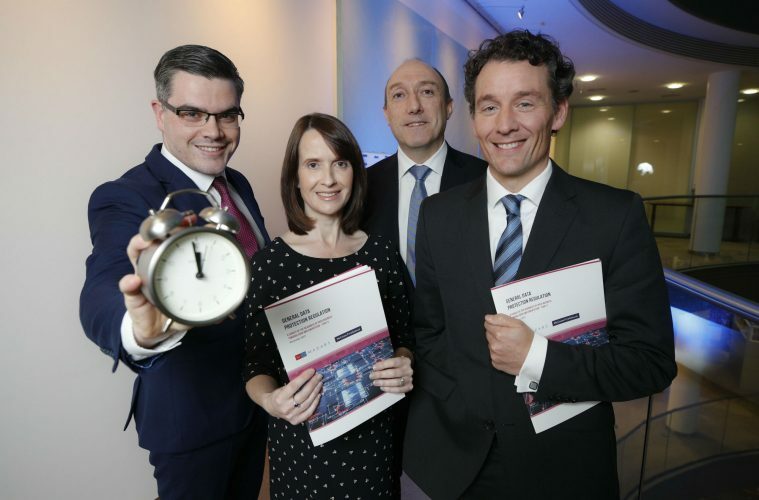 Mazars and McCann FitzGerald have released their second annual report on the readiness of Irish businesses for the General Data Protection Regulation (GDPR) which comes into force from May 2018. With just over 6 months to go, there continues to be a serious level of difficulty for Irish businesses in complying with the new requirements, though Irish businesses appear to be finally making real steps to get ready. In the year since the first report, 95% of businesses now believe that meeting the compliance requirements of the GDPR will be challenging or extremely challenging, an increase of 13%. However, 73% of organisations have now mobilised to tackle the compliance requirements of the GDPR, up from only 16% in 2016. Despite the significant rise in work being undertaken it seems that businesses are only now beginning to realise what the GDPR entails and how it affects them, with 75% now believing that their current data protection and privacy notices and methods of consent will require significant changes, an increase of 42% on last year. Specific concerns around GDPR implementation include the difficulty in complying with requirements for international transfers, with 89% expecting to find it challenging to extremely challenging. 64% think that the more explicit ‘right to be forgotten’ will be very or extremely challenging, a 9% increase on 2016. 62% expect the right to data portability to apply to their organisation’s activities, while 65% believe that facilitating that right will be challenging or very challenging. What actions are companies taking to get ready? 36% of organisations have yet to appoint a Data Protection Officer (a 6% increase since 2016) as is required under the new regulation. However, one continued positive trend is that 82% of organisations surveyed will have executive or CEO level sponsorship of GDPR compliance programmes, up 4% on 2016. In terms of notification procedures, 84% currently have a policy to notify data subjects in the event of a personal data security breach, a 15% increase on last year, and 85% have a policy to notify the local data protection supervisory authority, again up 4% since 2016. However, 44% think that meeting the breach notification period of 72 hours will be very or extremely challenging.